The Joint Dutch-Brazil School on Theoretical Physics is now in its third edition with previous schools in 2007 and 2011. This edition of the school will feature minicourses by Nima Arkani-Hamed (IAS Princeton), Jan de Boer (University of Amsterdam) and Cumrun Vafa (Harvard University), as well as student presentations. The school is jointly organized with the Dutch Research School of Theoretical Physics (DRSTP) and is intended for graduate students and researchers in the field of high-energy theoretical physics. There is no registration fee and limited funds are available for local and travel support of participants. This school in São Paulo will be preceded by the XVIII J. A. Swieca School in Campos de Jordão. The proposed school comes at an ideal time in order to compare and creatively confront different modern approaches to highly charged, structured, and disordered Coulomb systems. Its primary purpose will be to cross-pollinate the different theoretical, experimental and simulation approaches in order to progress towards a unified description of the electrostatic interactions in soft- and bio-matter. Approximate analytical theories as well as sophisticated simulations should pave the way in this endeavor and the school will first of all present their state-of-the-art as well as induce constructive interactions between these different theoretical approaches, as well as with the available experimental data. Besides a poster session, attendants will be also invited to give short talks about their research activity in their home country in specific sessions that will be reserved in the working agenda for this purpose. This school is aimed at graduate students and researchers in the fields of statistical mechanics, materials science, biophysics and nanobiotechnology. There is no registration fee and limited funds are available for travel and local expenses. "FÍSICA ESTADÍSTICA APLICADA A SISTEMAS BIOLÓGICOS"
Importante: La inscripción vence el 15 de noviembre. Los organizadores agradecen toda difusión que se pueda hacer entre alumnos y colegas interesados! The School will focus on the use of Statistical Physics techniques to the study of complex biological systems, with special emphasis in the understanding of metabolic, regulatory and neural networks. 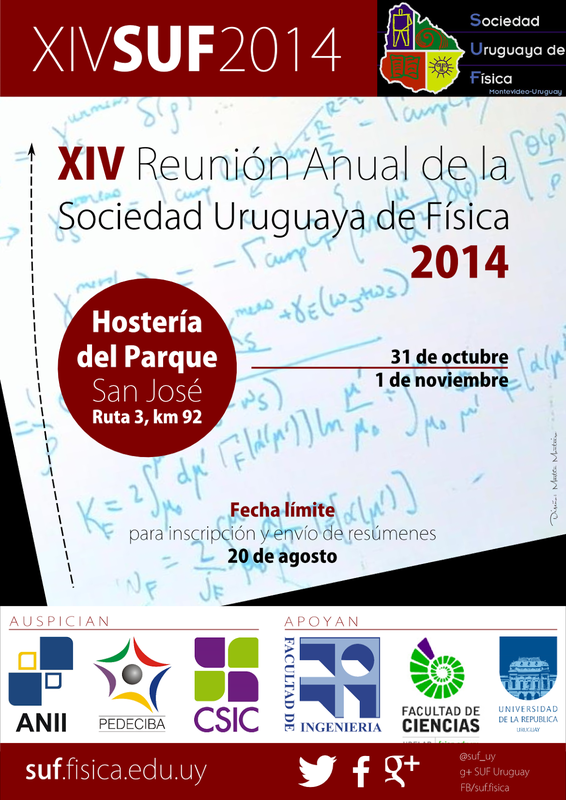 The school aims to gather in Latin America international renowned specialists in the field of Statistical Physics and Systems Biology, both theoreticians and experimentalists. 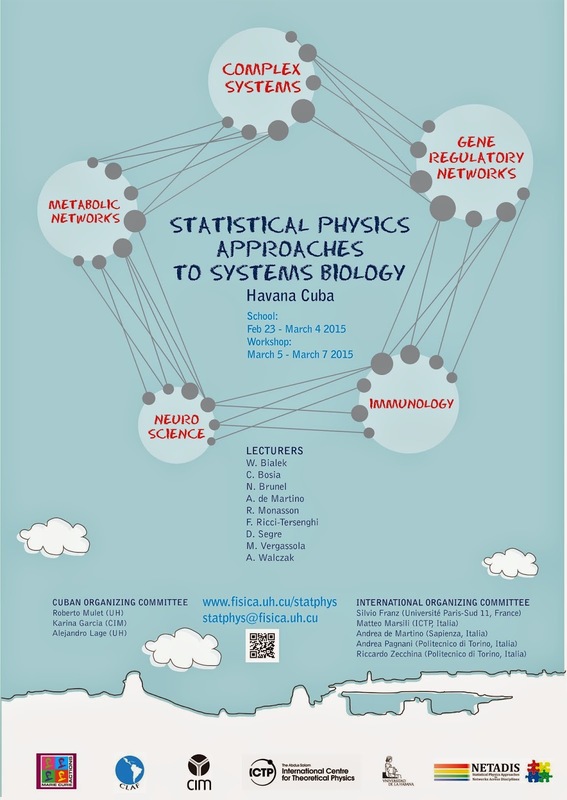 It will take place at Physics Faculty, Havana University, Cuba. Participants will be, most likely, Master, PhD students, Post-Docs and young researchers working in systems biology, statistical mechanics, bio-informatics or neuroscience (and similar topics), with interest/experience in theoretical models. Latin american students as well as those from NETADIS european project are most welcome to apply. Applications will be received from July 20th until November 15th 2014. The last three days will be held in a more advanced workshop format, with a wider spectrum of topics, including inverse problems, biological networks and theoretical immunology. 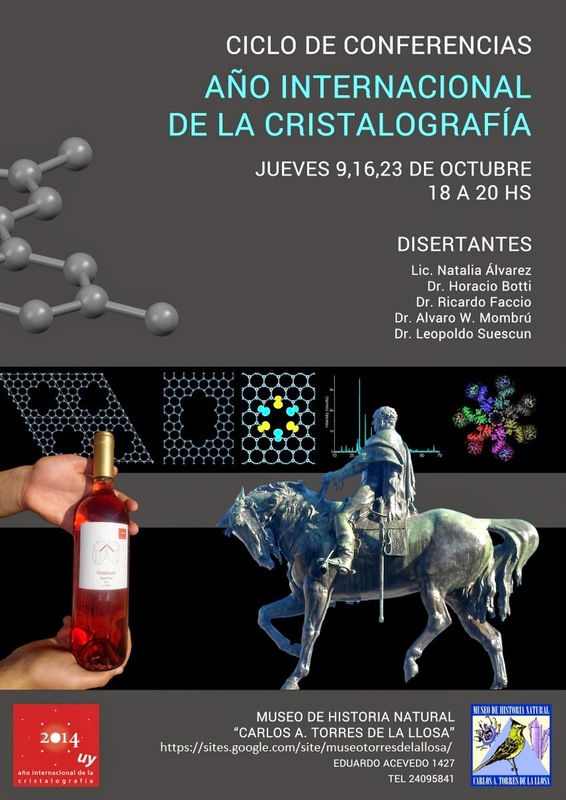 PEDECIBA-Física llama a aspirantes a participar en el Lindau Nobel Laureate Meeting 2015 (http://www.lindau-nobel.org/) a desarrollarse en julio de 2015 en Lindau. Presentar CV, escolaridad y en lo posible el nombre de un docente como referencia. IMPORTANTE: fecha de cierre lunes 13 de octubre 12:00. Lugar: Hostería del Parque, San José, km 92, ruta 3. Las inscripciones se encuentran finalizadas. Tenemos el agrado de comunicarles que este año realizaremos nuevamente el encuentro de la SUF a realizarse el 31/10 y 1/11. La sede será la Hostería del Parque, en San Jose (Km 92, ruta 3). Esta será una buena oportunidad para ponernos al día e intercambiar ideas. Invitamos especialmente a los estudiantes de grado y posgrado a participar activamente, presentando el avance de sus trabajos de investigación, tanto en forma de póster como exposiciones orales. Solicitamos a aquellos colegas que durante las fechas del evento tengo previsto recibir algún profesor visitante del exterior que nos lo hagan saber. Lugar: Hostería del Parque (San José). Fecha final de inscripción y envío de resúmenes: 20/08. Se prorroga el plazo de inscripción y envío de resúmenes: VIERNES 29 de AGOSTO, ÚLTIMO PLAZO. NO SE ACEPTARÁN INSCRIPCIONES FUERA DE ESA FECHA. Sólo se acepan resúmenes a través del formulario. En el cuerpo del resumen se deben indicar autores y filiaciones. Incluye: materiales, transporte, alojamiento, coffee-breaks y comidas (desayuno y 3 comidas, incluyendo un asado y un tenedor libre). A los efectos de facilitar la financiación del evento y ser eficientes en los recursos, este año se decidió cobrar una inscripción simbólica. Esta inscripción tiene dos precios diferenciados: anticipado y tardío.